Allow me to present an analogy between Krav Maga self defense and the concept of shopping. One guy made shoes. People liked the shoes he made and began to buy or trade for them. Another guy made ropes, same story. Eventually some clever guy came along and said, "Guys, this system does not make sense. How about we concentrate all the goods we need in one location, I will be in charge, and everyone can just come here and make all their purchases in one convenient location." Sounded good, sounded efficient, sounded practical and it so it was. All was good. Eventually the store keeper thought, "Now they are coming in anyway, so perhaps I will put some shiny trinkets out for sale." And so he did. Gradually shopping became a whole new experience. It was no longer a matter of purchasing essential goods necessary for survival such as shoes and rope; it was now a fun experience, an adventure in itself. People increased their spending and the store keepers were more than happy to keep offering more and more spending opportunities. One day another man, one who came from a "less developed" region, came along. "This is a colossal waste", he said, "You are wasting valuable time and money purchasing items you do not need. This is a waste of natural resources, most of this stuff you will never even use. It will simply end up in the waste basket." But the people had become accustomed to their shopping habits and they dismissed the warnings of the strange eccentric man. They continued to waste their time and money. To what might this be compared? Long ago people felt a need to defend themselves. They developed simple but effective martial arts. Life was short, one did not have many years to learn an art, and people had to work hard just to feed their families. So the art was simple, easy to learn and easy to apply in a wide variety of situations. Gradually masters of these arts emerged. They added techniques, they refined them and collected them and put them together in all sorts of fancy ways. Students who came to learn these styles became convinced that it takes many years and one must know very complicated moves. Masters liked this because it meant a student would stay with them for a very long time and become long term customers. Martial arts became categorized, ritualized, commercialized, and petrified. Then some guy from Israel came along. He said "Hey, martial arts should be more martial and less art. You guys have forgotten the original purpose. Where I come from we still use this to defend ourselves, as we are surrounded by hostile enemies bent on our destruction. We still stick to the basics, as you did a long time ago." 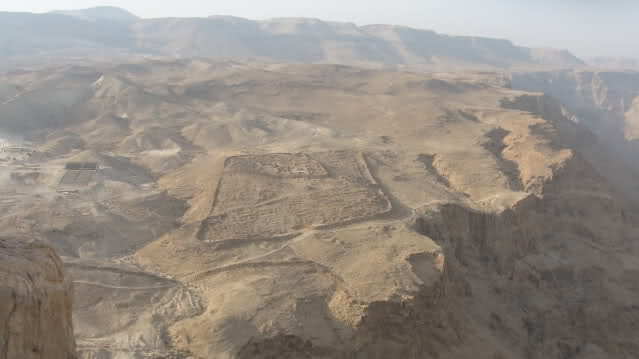 Masada, Israel, the ancient fortress where Jewish rebels held out against the Romans from 66-73 C.E. But the people looked at him and said, "Does he not understand that martial arts takes many years to learn? Does he not understand that first you must learn twenty five different stances, twenty kata, and five different step and slide motions? Does he not understand that the moves of the kata can only be discovered after years of daily practice and meditation? But the Krav Maga guy said, "It is simple, you must return to natural body movements, you must return to your instincts, it need not take so long!" The people, set in their ways, and convinced of their path, would not open themselves to this idea. They could not see that they already possessed their most effective and natural weapons, that no one need teach them their own instinct. And so he left them, stuck in their patterns and their endless repetitions, remaining convinced that if they changed their ways all would be lost. Krav Maga is about getting back to the core, to the basics, and finding something that works for you.